EDHEC is launching the EDHEC Bond Risk Premium Monitor in September 2017. Its purpose is to offer to the investment and academic communities a tool to quantify and analyse the risk premium associated with Government bonds (with an initial focus on US Treasuries). We calculate the risk premium using two distinct methods: (i) a purely statistical method and (ii) a model-based method. The compensation for taking yield curve risk has slightly moved down again, and is well in negative territory for all maturities between 3 and 10 years. The reason is simple: the market yields are now below the expected path of the short rate (the “blue dots”), despite the very subdued projections of the Fed, which have never been lower, and which now even seem to imply a rate cut in the medium future. Much has investors have been fretting about the possibility of a recession being priced in the shape of the yield curve, the most striking observation is by how much the Fed has lowered its expectations for the long-term target of the Fed fund rate, with the median last blue dot now below 3%. With an inflation target between 2% and 2.5% this implies a long-term projection of virtually zero real growth. Why are market yields below the path of the blue dots? There can be two explanations: either the market expectations differ from the projections of the Fed; or there is a negative risk premium (as our model captures). A negative compensation for taking risk is compatible with Treasuries being perceived as a portfolio hedge to equity risk. The recent equity market turbulence makes the desire for equity protection topical. In sum: Very low real long-term growth implied by the yield curve. Perhaps a recession in the medium term priced in the path of the blue dots and the shape of the yield curve. Risk premia small and negative, consistent with Treasuries being perceived as “equity insurance”. What rests to be seen is whether, when push comes to shove, after the “Greenspan/Bernanke/Yellen put” we will see the Powell put. Politics says that we will; monetary considerations make us more cautious. EDHEC is launching the EDHEC Bond Risk Premium Monitor in September 2017. Its purpose is to offer to the investment and academic community a tool to quantify and analyse the risk premium associated with Government bonds (with an initial focus on US Treasuries). The following FAQs provide detailed explanations of what it can offer. What is the EDHEC-Risk Premium Monitor? The EDHEC Bond Risk Premium Monitor is a suite of tools that can be used to estimate the risk premium embedded in US Treasury bonds of different maturities. In general, the risk premium can be thought of as the compensation investors require in order to bear the risks entailed in holding an asset. More precisely, it is proportional to the covariance between the pay-off of a security and the consumption of the investor. If we proxy consumption with return on investments, the risk premium should be proportional to the covariance between the pay-off of a security and the return from a broad market index (for example, the S&P 500). For a precise definition, see Cochrane (2001), Asset Pricing, Princeton University Press, or Rebonato (2018), Bond Pricing and Yield Curve Modelling – A Structural Approach, Cambridge University Press, Chapter 15. In the case of (riskless) bonds, the risk premium is associated with the strategy of being ‘long duration’, (i.e. of funding a long position in a long-maturity bond by shorting a short-maturity bond). The strategy is often referred to as a ‘carry’ trade. Why is the risk premium important? A high risk premium suggests that, on average, one can expect to make money from investing in long-term bonds and funding at the short end. From an asset manager’s perspective, a high risk premium suggests that it is a good time to be ‘long duration’ with respect to the chosen bond benchmark. 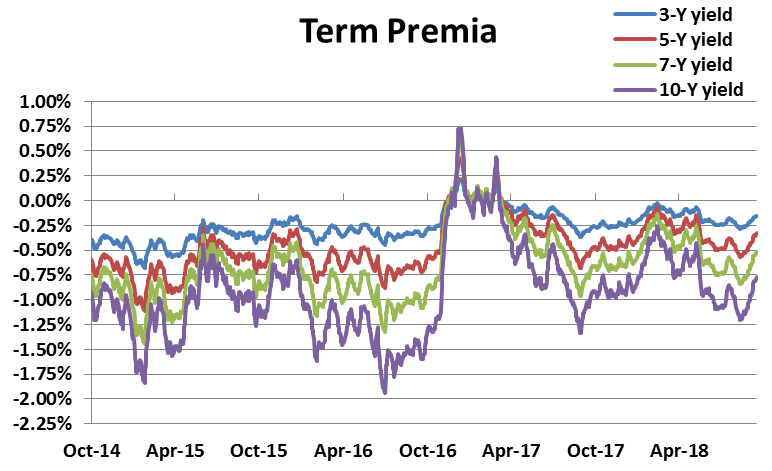 Risk premia also allow the market expectations about the future path of the short rate (Fed funds) to be extracted from the market yields. Sometimes the risk premium produced by the monitor is negative – how can that be? From an asset pricing perspective, if an asset ‘hedges’ the risk from the market portfolio, then it will command a negative risk premium (we pay for fire insurance above the actuarial odds). So, if bonds hedge equity risk very effectively (the Greenspan/Bernanke/Yellen ‘put’), investors may then be willing to accept negative risk compensation for their hedging properties. Less precisely, it is often argued that, in an environment of extremely low (real) returns, ‘hunger for yields’ can drive risk premia into negative territory. What does the risk premium depend on? There is ample evidence that the risk premium is not a constant, but rather that it depends on the state of the economy. In turn, some aspects of the state of the economy are reflected in the shape the yield curve – so, the magnitude and sign of the risk premium depends (in part) on the shape of the yield curve. How is the risk premium calculated? How does the statistical estimate of the risk premium work? The statistical estimate of the risk premium is based on the analysis of the returns made by investing in a long-maturity bond and funding the position at the short end of the yield curve (the ‘carry’ strategy). If forward rates were unbiased expectations of future rates, then, on average, the carry strategy would make no money. Once a time series of excess returns has been obtained, that time series can be regressed against a number of candidate return-predicting factors, and it can be determined whether any of these factors are statistically significant. It must be stressed that, in order to avoid data mining and ‘factor fishing’, it is very important to give an economic explanation for the return-predicting factor. Why are there several statistical predictions of the risk premium? Different return predicting factors give similar, but not identical, estimates of the risk premia. The more complex the return-predicting factor, the better the in-sample fit, but the grater the danger of over-fitting (and therefore of poor out-of-sample-prediction). We present the predictions from a (small) number of return-predicting factors, and the average of the predictions. 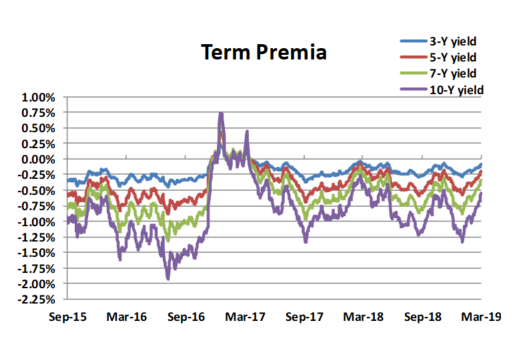 We stress that changes in risk premia are more reliably estimated than the level of risk premia (the ‘slopes’ of the regressions have tighter confidence bands than the ‘intercepts’). Which return-predicting factors have been chosen? the unconditional slope and the level cycle (VI). We also present the average of the four predictions, which is arguably the most reliable estimator. Why are you using a model-based approach as well? Statistical models implicitly assume that the future looks like the past. As, over the last few years, authorities have been engaged in unprecedented monetary operations (QE, negative interest rates, etc. ), past regularities may not apply to the present market conditions. Purely statistical models can therefore be ‘tricked’ by spurious similarities with past yield curve configurations. This is where a model can help, by adding financial information to the purely statistical data. What kind of financial information is added by the chosen model? The extra financial information comes from the so-called ‘blue dots’ – predictions by members of the Monetary Policy Committee of the U.S. Fed about the future path of the fed funds rate. So, with the statistical approach, we try to directly estimate the risk premium, and we obtain the expectations as a by-product. With the model-based approach, we try to estimate the expectations and we obtain the risk premia. (In both cases, we take the market yields as given. Which specific model is used to estimate the risk premium? The model used belongs to the class of affine models. It is unique, however, in that it allows the market price of risk to be stochastic: instead of being a deterministic function of the shape of the yield curve, it is still only correlated with the established return-predicting factors. This means that, given a particular shape of the yield curve, the market price of risk does not always have to assume the same value. This is particularly important given the atypical monetary conditions encountered in the last ten years or so. (I) Strictly speaking, one should also take convexity into account. For a discussion, please refer to Rebonato (2018). Bond Pricing and Yield-Curve Modelling – A Structural Approach, Cambridge University Press, Chapters 20-21. (II) See Rebonato (2018). Bond Pricing and Yield-Curve Modelling – A Structural Approach, Cambridge University Press, Chapter 24. (III) See Cochrane, J. H. and M. Piazzesi (2005). Bond Risk Premia. American Economic Review 95(1): 138-160; for technical details, and the regression coefficients, see https://www.aeaweb.org/aer/data/mar05_app_cochrane.pdf (accessed on 25 November 2014). https://www.gsb.stanford.edu/sites/default/files/documents/fin_01_11_Cie..., accessed on 5 May 2015, and Cieslak, A. and P. Povala (2010b). Expected Returns in Treasury Bonds, working paper, Northwestern University and Birbeck College, forthcoming in Review of Financial Studies. (VI) Hatano, T. (2016). Investigation of Cyclical and Unconditional Excess Return Predicting Factors. MSc thesis – Oxford University. (VII) See Rebonato (2018). 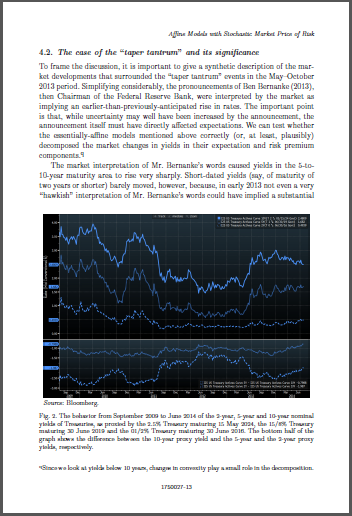 Bond Pricing and Yield-Curve Modelling – A Structural Approach, Cambridge University Press, Chapter 25 for a discussion of this point. (VIII) For a chapter-length description of affine models, see, Piazzesi M. (2010), Affine Term Structure Models, Chapter 12 in Handbook of Financial Econometrics, Elsevier, or Bolder, D. J. (2001). Affine Term-Structure Models: Theory and Implementation, Bank of Canada, Working paper 2001-15, available at http://www.bankofcanada.ca/wp-content/uploads/2010/02/wp01-15a.pdf , accessed on 11 August 2017. For a book-length treatment, see Rebonato (2018), Bond Pricing and Yield-Curve Modelling – A Structural Approach, Cambridge University Press. (IX) For a detailed description of the model, see Rebonato (2017). Reduced-Form Affine Models with Stochastic Market Price of Risk, International Journal of Theoretical and Applied Finance(forthcoming). particular, we look at the extension of a popular doubly-mean-reverting Vasicek model, but the idea can be applied to all essentially-affine models.